In GOOMI these terms were setup in the Inco Terms application. There are some default settings already available within the application, the user can modify it or create new terms. These Inco terms can be found in transactions like purchase invoice and goods receipt as Inco Terms for the user to select. 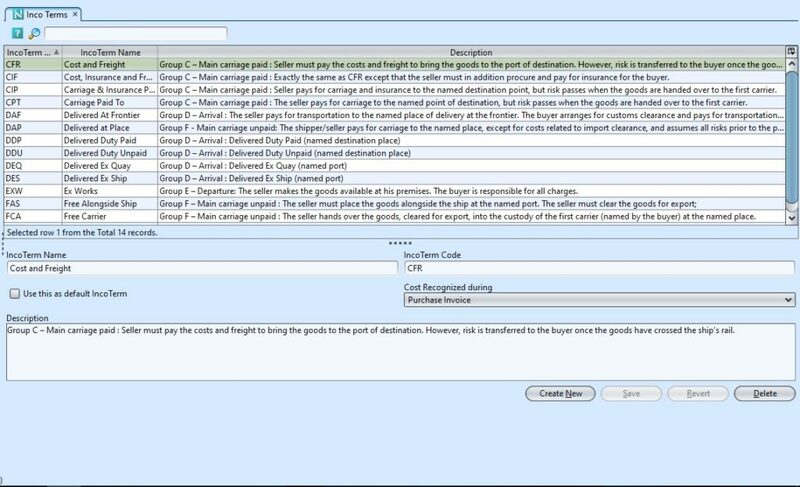 Create new unit, edit and delete inco terms. 1. Click on Inco term record to be updated, it will show the details at the bottom half of the screen for the selected Inco term. 1. Click on Inco term record to be deleted, it will show the details at the bottom half of the screen for the selected Inco term.